I have used a Project with VCS (GitHub). Now I want to switch off VCS-support for that project. How can I do that? Settings | Version Control ... ? If I remove the path to the git.exe, I got an error. 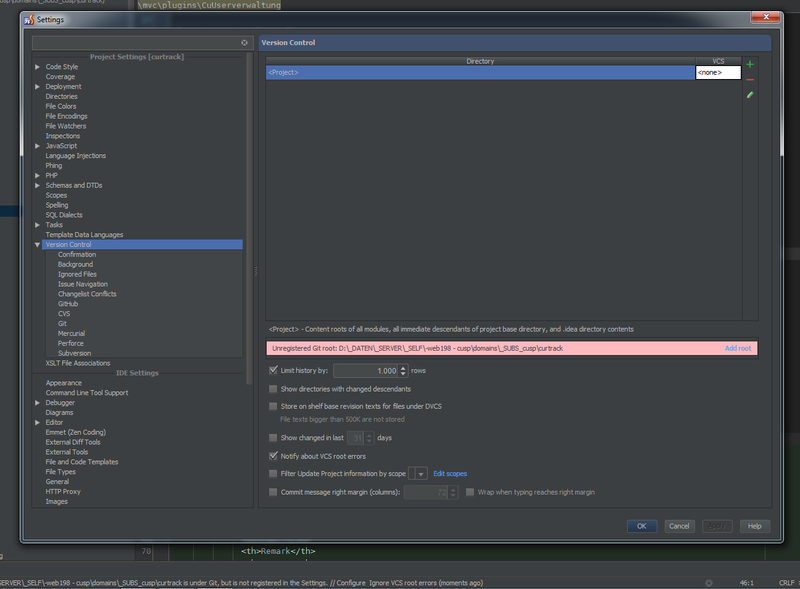 If I remove the path in theVersionControl Directory - I got an error. You should use "-" (minus) button to remove VCS association completely .. or set value in "VCS" column to "none". What error? The one on pink/light-red backgound on your screenshot? 2) Delete your git related files (.git folder/files) -- sorry, I've never worked with git/github before. I got two errormessages: One is in the screenshot, and the other comes up in the right top corner when I load the project. Now I have removed the directory .git - and it looks like it would work.